As we can now clearly discern, the fiscal cliff had already miraculously diminished to less than half of the Governor’s initial claim, or rather demand for more taxes, but even so the House Fiscal Division then most unhelpfully (from the Governor’s perspective) calculated the actual number to be no more than $495M. Our Republican legislators’ trust in this administration’s deficit figures are by now understandably at low ebb. Bluntly speaking, the Governor and his legislative allies have not been truthful with the public about the fiscal cliff. Rather, the Governor has repeatedly and over a period of years used wildly differing numbers which he knew were inaccurate at the time, to terrorize the public and its legislative representatives into raising taxes unnecessarily. He further compounded this chicanery by loudly proclaiming the approaching end of the state hospital system and the ejection of 37,000 nursing home residents onto the streets, albeit the public was at least spared on this particular occasion the impending specter of the demise of the LSU football program. There is of course no reason to believe that he has now abandoned this ruse, but the damage done by this Governor’s lack of honesty is plain for all to see in the shattered wreckage left by nine legislative sessions in just over two years, and the terrific toll this has taken on our legislators, both Republican and Democrat alike. But there is much more: The Governor’s current deficit figure is based on his administration’s requests for monies for the various departments of state government, which of course includes increases that have already been factored into the fiscal cliff. We believe that rather than increasing the budget of our state’s government, which is widely acknowledged to be the most bloated and inefficient in the entire country, we could most certainly reduce most departments by a reasonable amount (2-4%, for example). These reductions would in no wise impair the functioning of our government. Increasing governmental efficiencies is after all nothing more than was promised to us by John Bel Edwards himself, along with his many other long since forgotten campaign promises, including his promise not to raise taxes. Continuing onward (or should we say ‘downward’? 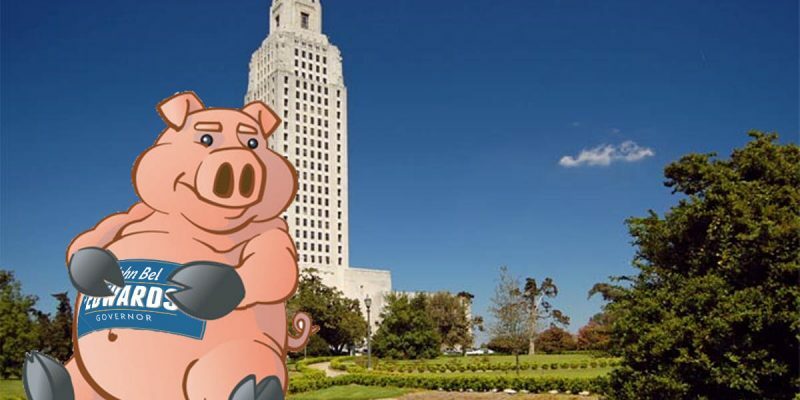 ), the state’s own legislative auditor has stated that the purging of the vastly expanded Medicaid rolls of those ineligible to receive such assistance (thank you again, Governor Edwards), would by itself resolve the fiscal cliff within a short time. All that would be necessary is the willingness of this administration to compare the income tax returns of Medicaid applicants and recipients with the income declared on their Medicaid application form, and tens of thousands would be removed forthwith from the rolls. Additional savings could be gained merely by eliminating the 25% income error allowance for applicants, who should full well be able to determine their true income to within a few percent. As the tax battle unfolded on the Senate side, HB 27 by Rep. Lance Harris (Rep., Alexandria), an attempt at compromise which sought to raise $365M by raising sales taxes 1/3 of a cent while reducing government spending, received rough treatment at the hands of the Senate Revenue and Fiscal Affairs Committee chaired by Rep. J. P. Morrell (Dem., New Orleans). More properly, one should say that the original bill had already been hijacked by Democrats, who immediately added over $300M in additional taxes, which would essentially grant Governor Edwards demand for $648M in taxes if it were to become law. So much for Republicans’ attempt at compromise! Which leads us to the present. The next few days will determine not just the size of the tax increase to be borne by our tax-paying citizenry, but also the direction of our state government and thus the future of all Louisianians. At issue are fundamental questions: Whether we will demand that our government live within its means, or allow it to grow ever larger and less accountable to the people? And whether Louisiana will make an attempt to become competitive with other states, or continue to lose business, wealth, and population to our neighbors? Let us hope that all of our Republican legislators, both senators and representatives alike, join in holding the line on taxes and supporting Rep. Harris’ original bill, or something very much like it. There is too much at stake to allow for anything less.